I love the holiday season! The shopping, the wrapping, the decorating, the crafts, the baking, the Christmas carols…okay, not the Christmas carols. I don’t know why, but I do not like Christmas tunes. I also love all the holiday food – both making it and eating it. With an energetic toddler at home, most of our meals have to be easy to prepare. It seems like my son is eating all day long so I always like to have a few quick & easy snack ideas for him. Now that he’s two years old and able to be more adventurous with his meals, I want to start making him more “cute” food. I’m not sure if he’ll notice it yet but it’s worth a try! 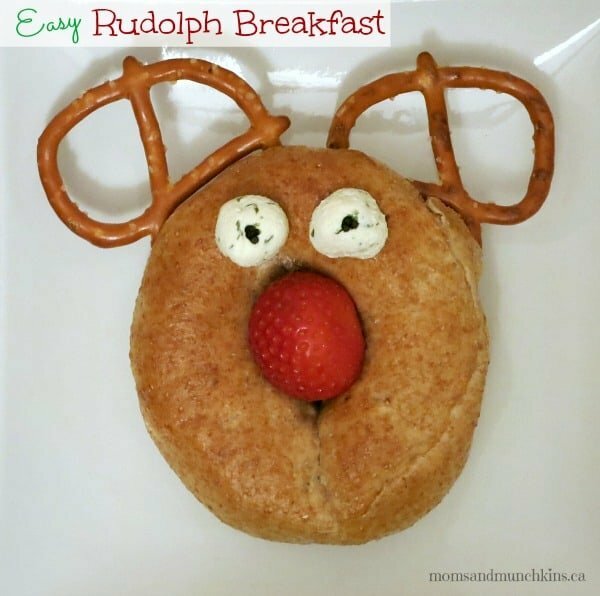 With snow now here to stay, I have Christmas food on my mind so today I came up with this easy idea for a cute Christmas breakfast – Rudolph Bagels! This started off as a brilliant idea for Rudolph donuts with a red chocolate covered cherry nose and pretzel antlers. I then looked up my brilliant idea on Pinterest to see that this is in fact in old idea that people have been doing for years. Don’t you hate when that happens? Just when you think you start thinking you’re amazingly cleaver…Pinterest shows you that you may in fact be the last person to think of the idea. Oh well, I sat down again to think of a new idea and I came up with Rudolph bagels! These are really easy to make. Start with a bagel and you can put whatever you want inside – cream cheese, jam, scrambled eggs, etc. Sandwich the bagel together and put two pretzels inside the top of the sandwich to stick out like antlers. For eyes, I used little rolled up balls of cream cheese with a small black icing sprinkle for a pupil. Finish it off with a strawberry nose and you’re all done! For more creative ideas for the holiday season including free printable games, recipes, party ideas and more, visit our Christmas Fun page.